Book club is tonight. 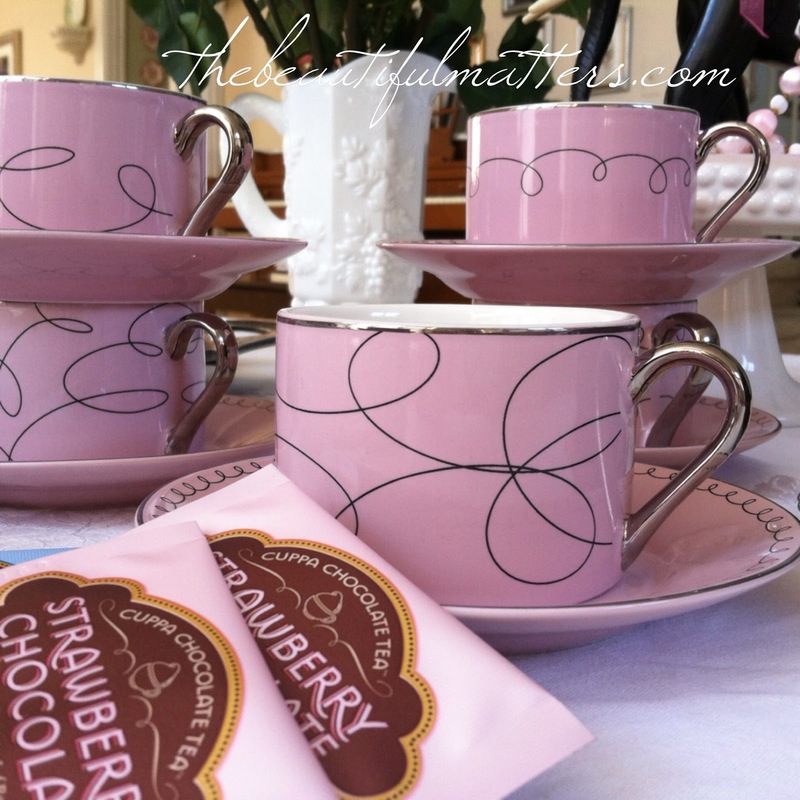 I borrowed these beautiful pink cups from my daughter for our tea. They are more modern-looking than any I own. Aren't they chic? Look at how well this teapot matches. I just got it this weekend at a local tea shop. They were having a Downton Abbey tea tasting party. There were prizes and extra chances to win if you could answer Downton Abbey trivia questions. I was asked, "what event caused Matthew to be next in line as heir?" Of course, the answer was, "the sinking of the Titanic." Prizes to be announced later include official Lord Grantham tea, Downton Abbey jewelry, and more. I was looking for an everyday workhorse teapot that is comfortable to pour. The one I'm currently using is too long horizontally, and I always feel it's going to tip forward when I pick it up when it's full. My nice white Rockingham teapot got a major crack in it, and I've been looking ever since for another round white pot. But then I saw this pink beauty. I think I could use this every day, don't you? The conundrum is that the teapot is mine and the cups are my daughter's. Hmmm . . . we'll just have to have tea together. We picked up some prettily packaged tea. As delicious as this looks, I will leave it for my friends, as I mostly prefer plain black teas. I got some loose Darjeeling for myself and got my daughter some loose Victorian Earl Grey. Here's the tea table . . . I have a tiny chocolate cake here because one of the book club ladies had a birthday Saturday. We'll sing "happy birthday" to her. Most of the ladies are very health conscious, and don't eat too many sweets so a small cake will be enough. They usually bring other treats as well. I will probably just add some fruit. I was thinking I needed a little black and pink decoration to match the cups, and before you know it, old Mrs. Elephant was getting a little makeover. I featured her little son in a previous post here. Those are real ivory tusks on this elephant which came from my husband's great-grandparents' time in Africa. She is atop a little cake stand on a piece of striped pink and white scrapbooking paper, and surrounded by pink and white baubles. Isn't she adorable? I love crisply ironed linens, but I can deal with freshly laundered, slightly rumpled ones, too. 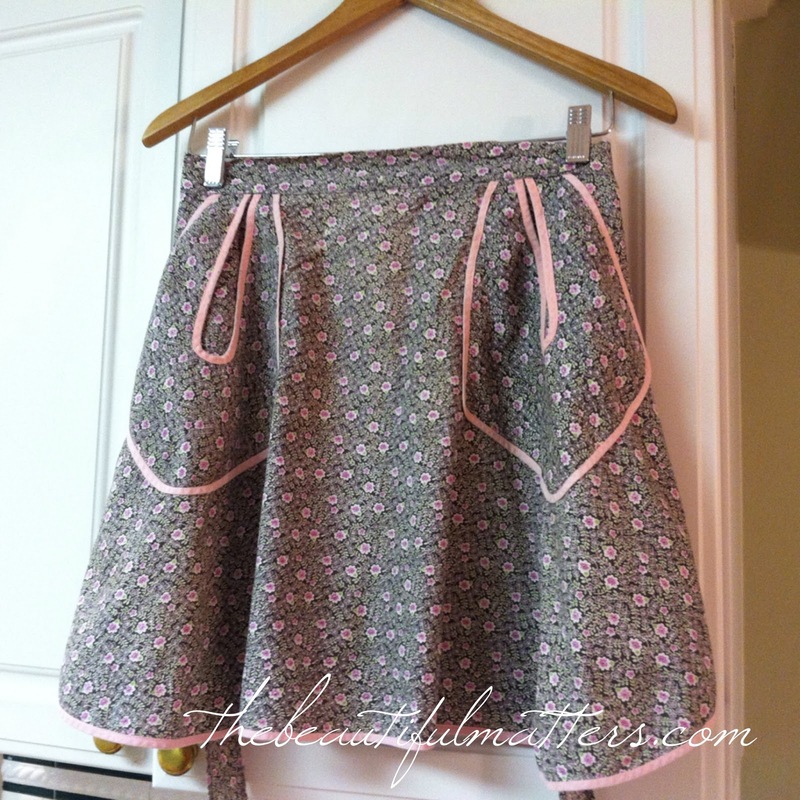 Below is a vintage apron I just laid on the table because I thought the fabric looked pretty with the dishes. A notebook is always good to have on hand for jotting down ideas and thoughts . . . I've been trying out this new Waterlogue app that I've been seeing featured on a few blogs. Here is one of the above photos . . . Isn't this great? It turns your photos into "watercolors." 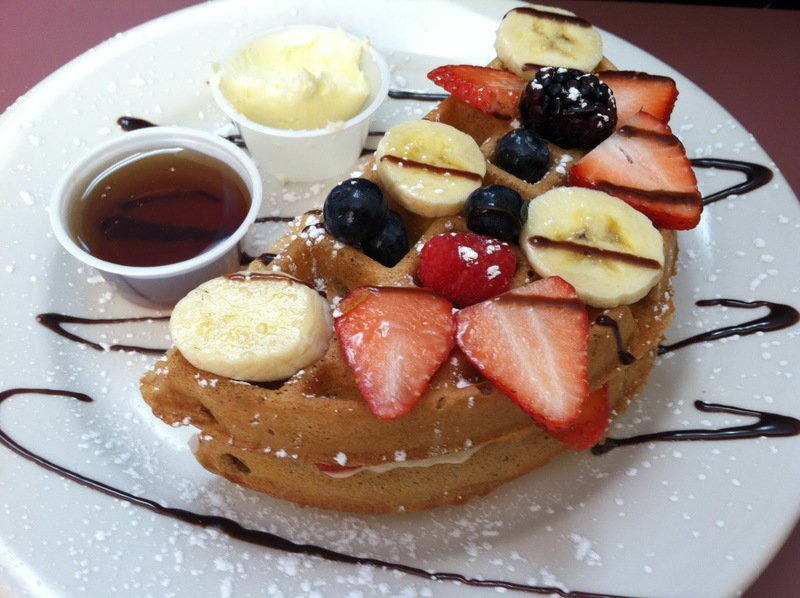 On another note, feast your eyes on this delicious-ness. We went out for breakfast after church Sunday, and my daughter got this . . . It had a sweet cream filling. She let me have a couple bites. Mmmm. 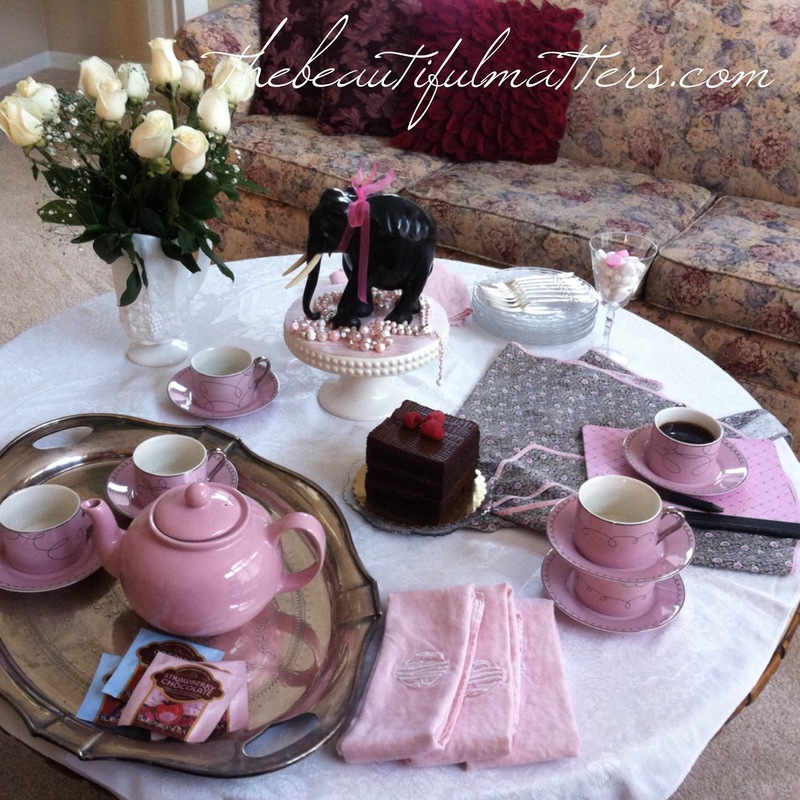 Thank you for joining me for my pink elephant tea. And thanks to all of you who have left such lovely comments. You have been a wonderful encouragement to this new blogger, and I'm thankful to meet such truly kind people. thanks, Lori. I'm sad Downton Abbey was such a short season. At least there was no awful tragedy at the end this time! Loved Mrs. Hughes and Carson holding hands at the end. Oh Deborah, your pink dishes are to die for!!! I've seen some beautiful potos turned into watercolors, how awesome it is! This setting is marvelous, I love it. Have a great week. thanks Fabby! You have a wonderful week too! Your book club ladies are in for a real treat. It looks lovely. What book are you discussing? The Kitchen House (see my comment below). I might put a list of our books in my sidebar; we've read some really good ones I can recommend. Deborah: All of your pink is so pretty! I have tried to get a book club started, but no luck yet. I love having a regularly-scheduled time to get with friends. I bookmarked the photo of your daughter's breakfast. it looks so delicious and it seems like it would be easy to copy! Have fun with your book club tonight. Are you all reading anything interesting? We just finished The Kitchen House by Kathleen Grissom. I found it very depressing and hard to push through as it was just one tragedy after another. About an indentured servant on a plantation in the Old South. I'm usually much more enthusiastic about the books we read. And I love my book club; hope you can get one started. 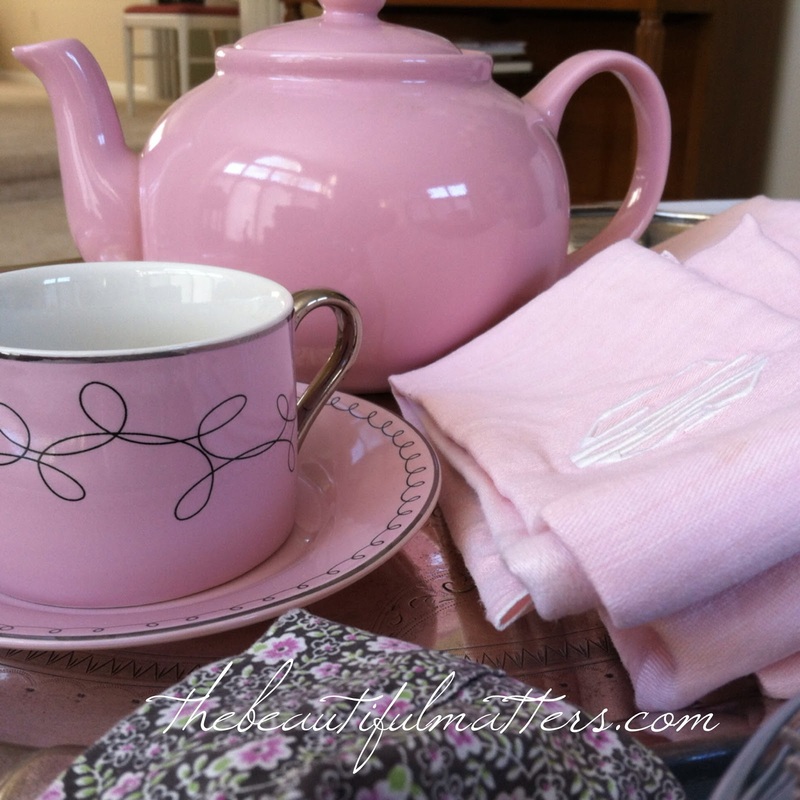 Love your pink teapot and your daughter's pink cups. They look great together and your table is pretty too. Deborah, I love your pink teapot and your daughter's teacups go so well with it. 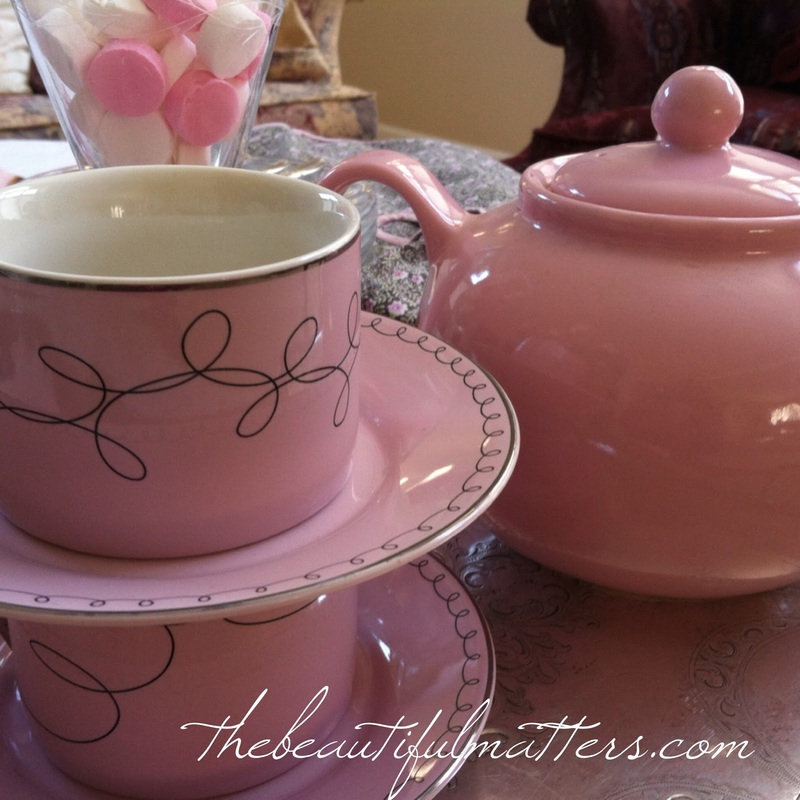 Using a pink teapot every day would be right up my alley! The elephant is so cute. I had a set of teak elephants with real ivory tusks that were a wedding gift. My youngest son always liked them and when he went away to university he asked if he could have them and of course, Momma said yes! 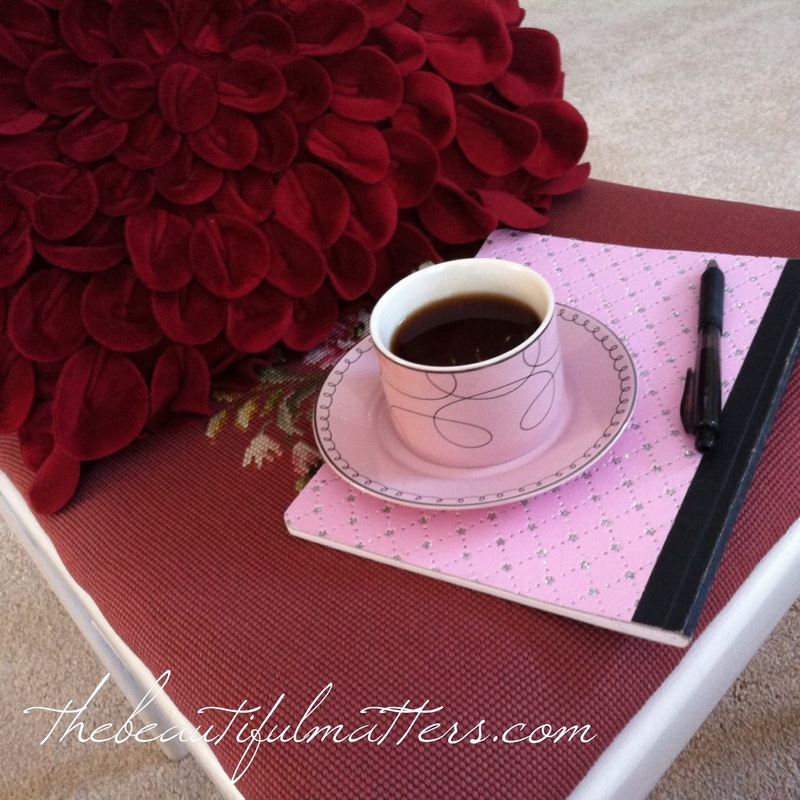 Love your pretty tea table and thank you for sharing it with us. 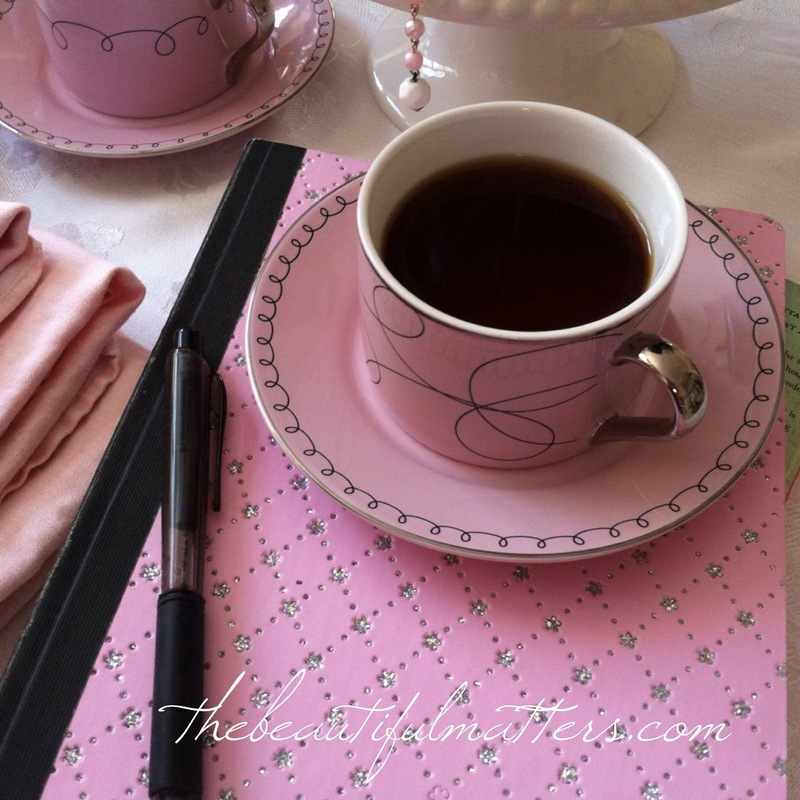 Your new pink teapot and your daughter's teacups look nice together and the whole table should make your book club appreciate how feminine it is. The black elephant is a nice contrasting touch, a good conversation piece. Have fun at your meeting tonight. 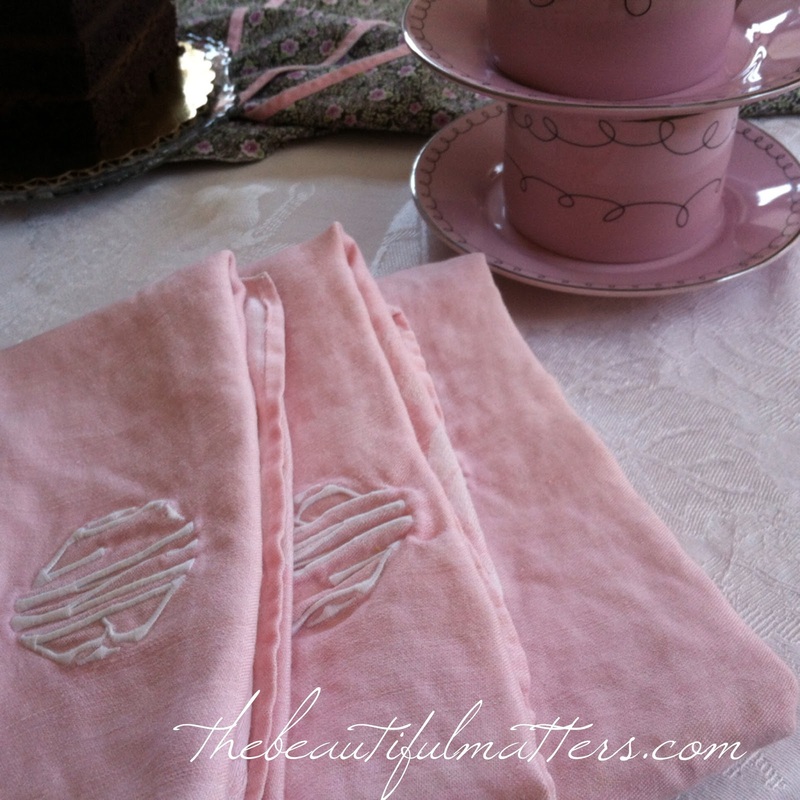 The Downton Abbey tea sounds like it was fun as is your pretty in pink post! 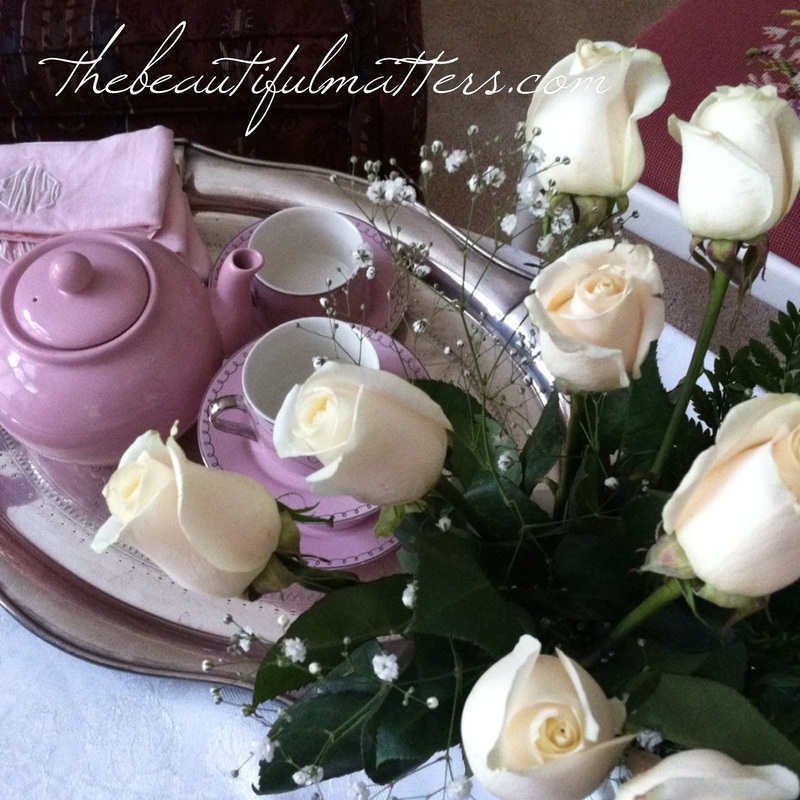 Your daughter's teacups are very chic and modern and go beautifully with your new teapot. The teapot would bring a smile to my face every time I used it! 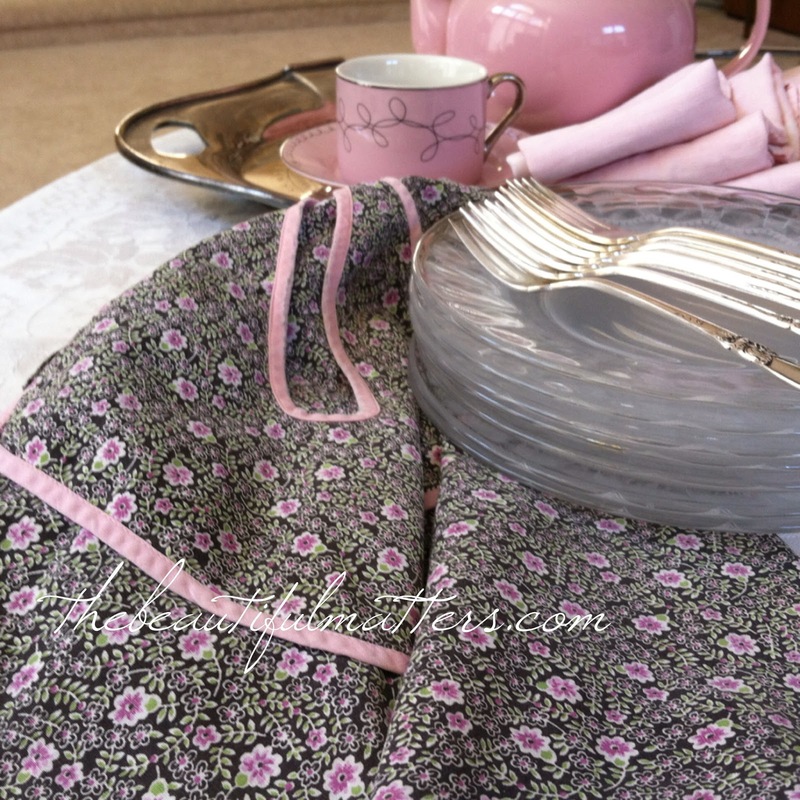 Love teascape. Enjoy your book club. Happy Tea Day! 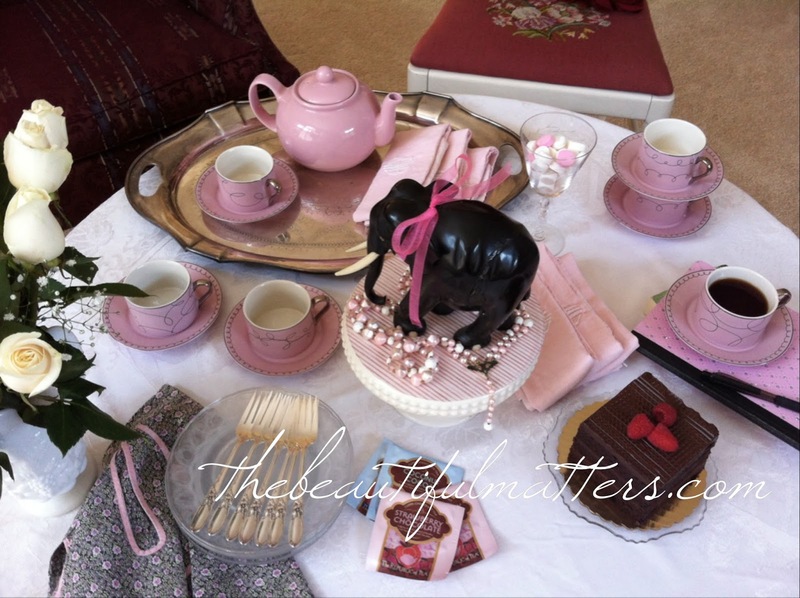 The pink teapot is terrific and goes so well with everything. Enjoy your book club! 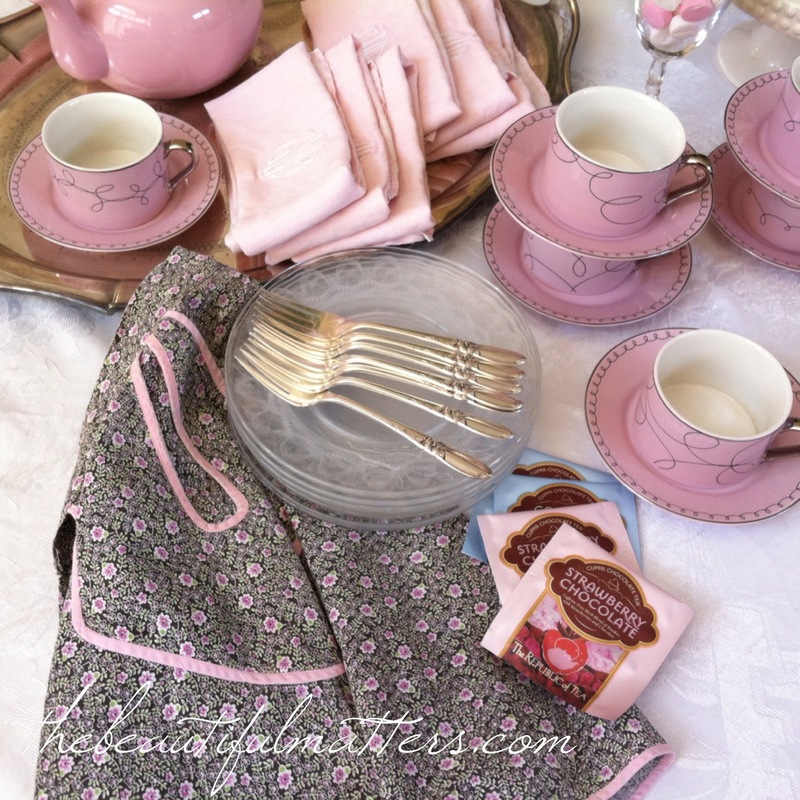 Oh I love the pink colors in the teapot and teacups, it is perfect. 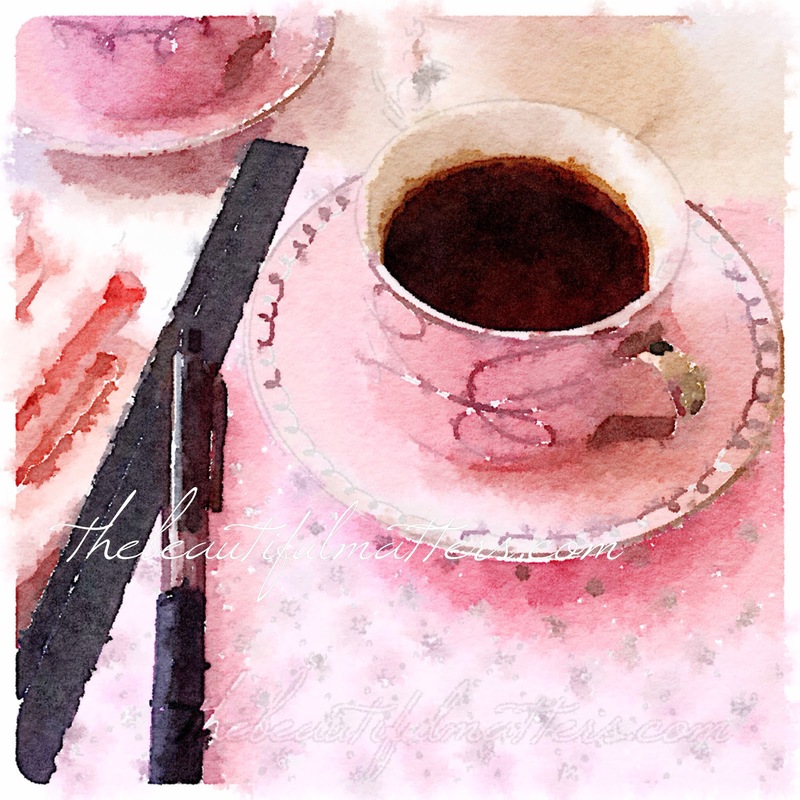 I have not heard of the app Waterlogue so I will have to check that out. Thanks for sharing the idea ~ Hope you follow me too. The teacups and the teapot look beautiful together, Deborah. Pink is such a happy color, isn't it? Your table is beautiful, as always. All of it -- the colors, the cloth, the cups and pot -- is ethereally beautiful. The pot is perfect! And the cups ... does each one have its own "swirl" pattern? So adorable! Your daughter is fortunate to have such a cute set. I know the ladies must have thoroughly enjoyed it all. 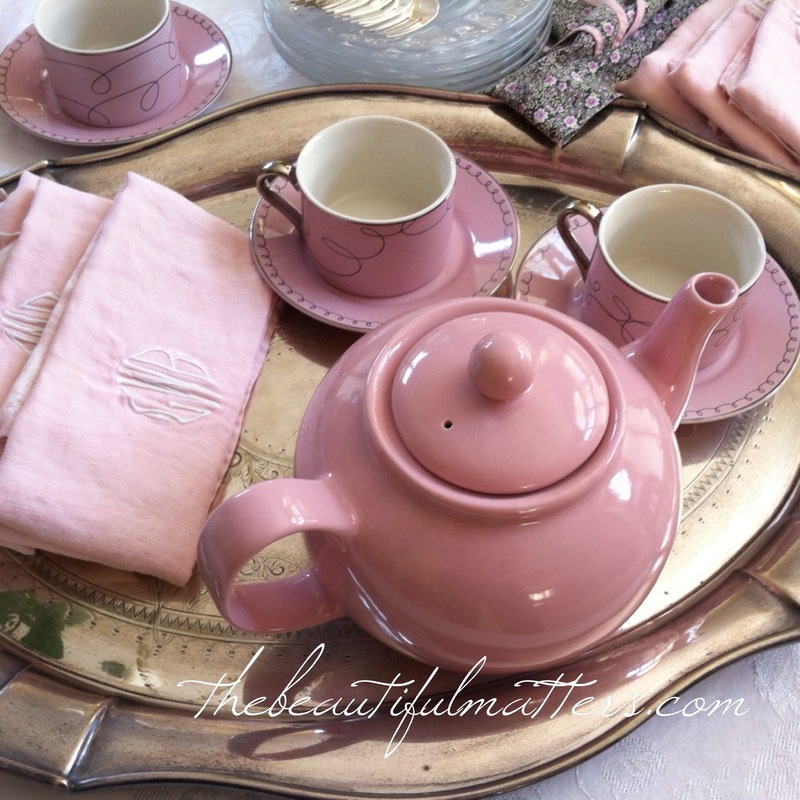 A perfectly pink tea setting. 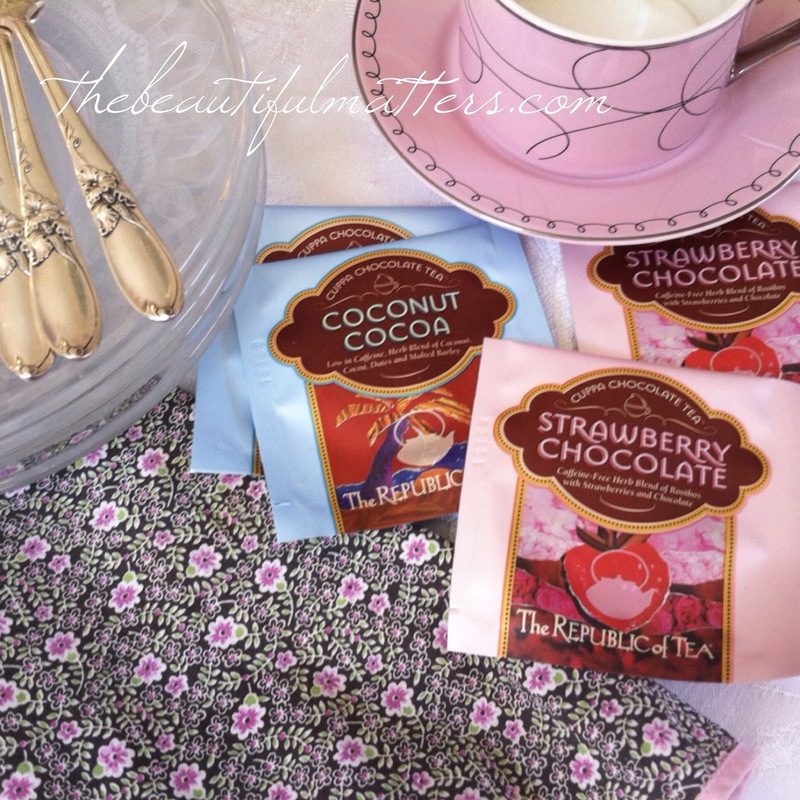 Strawberry chocolate tea sounds yummy. 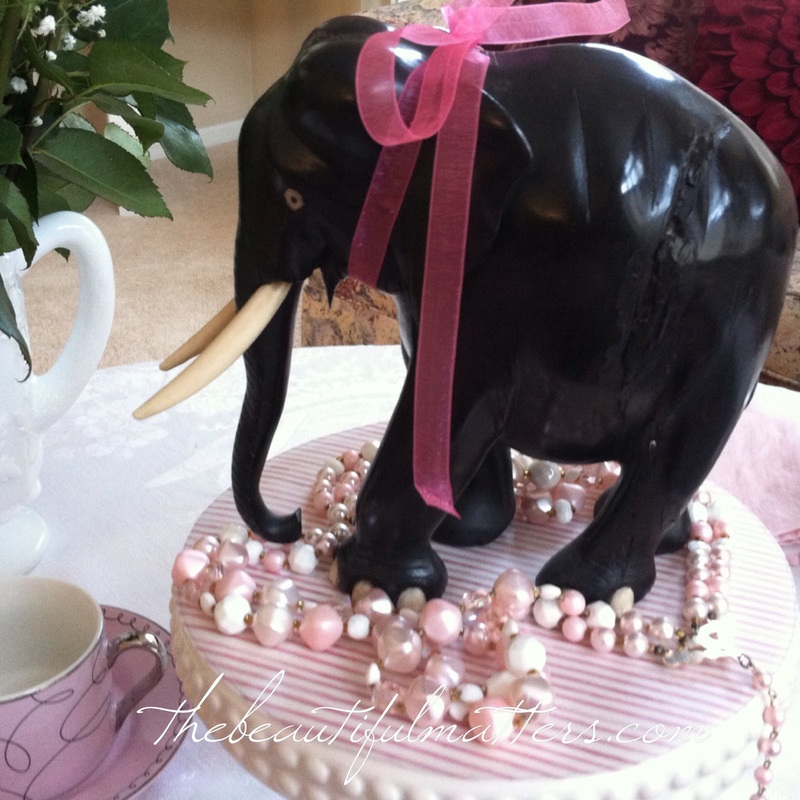 I love the elephant as a conversation piece and to tie into the black. Lovely photos. thank you for visiting Angela! What a lovely table set for tea. I'm sure your book club ladies will enjoy the prettiness. 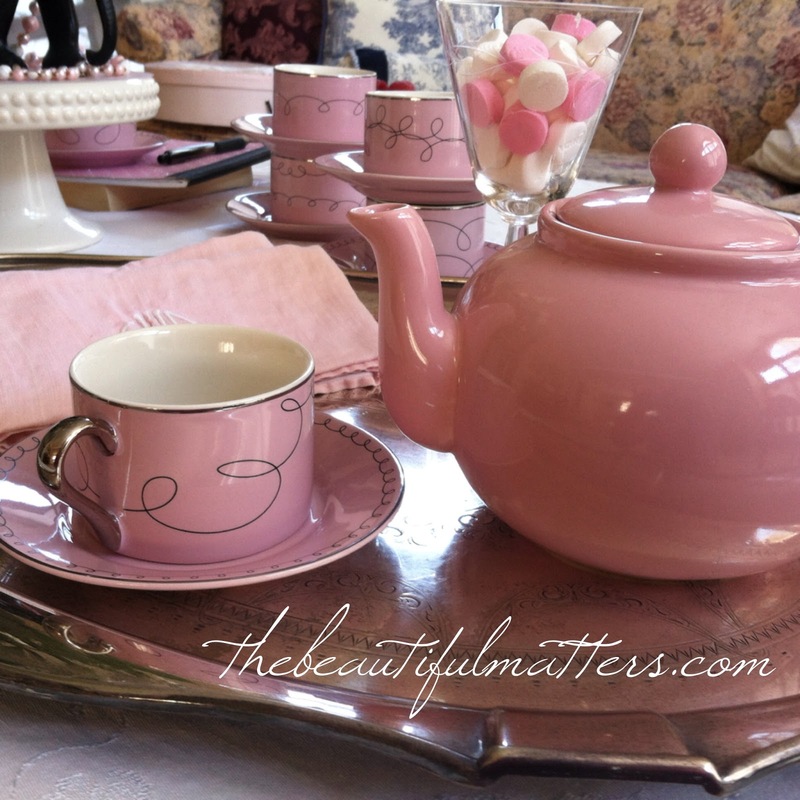 That pink teaPot looks like one I have and it makes a great pot of tea. What book are you discussing? The Kitchen House, which I thought was tragic and depressing. But one of the good things about a book club is getting others' opinions and perspectives. Several spoke about the strong characters that they admired in the book. and yes, so far I'm loving this tea pot! I love your pinks and browns together. What a lovely tea your daughters teacups and your pink teapot makes. Thank you for following and have a nice week. Oh Rosie, you made me laugh this morning! thank you. Oh, this is a beautiful tea Deborah! I love your pink teapot. It is perfect with those cups. I like the tea packets too. 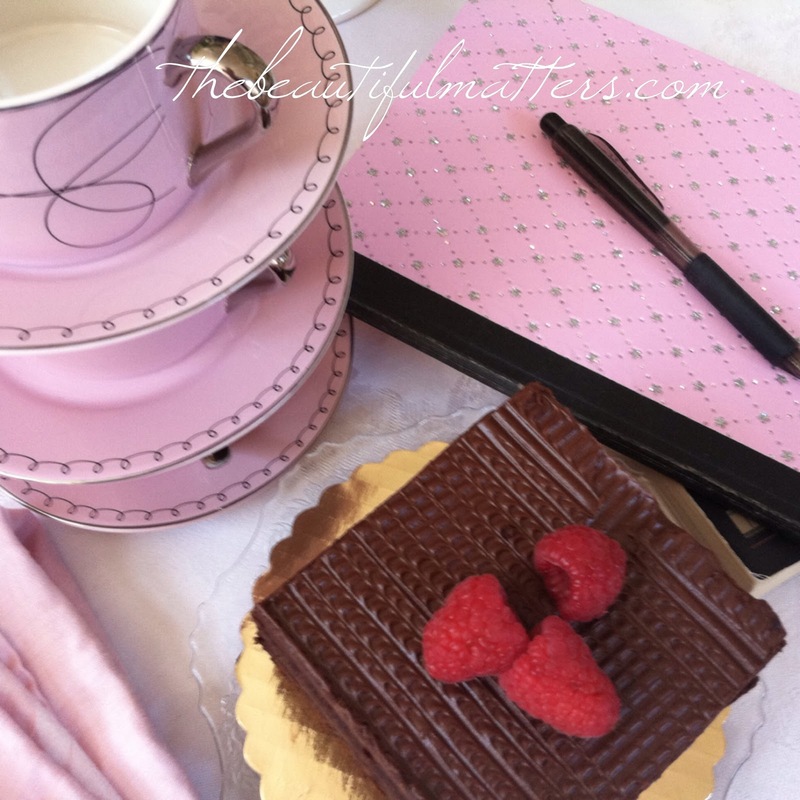 I see strawberry chocolate tea, that would go well with my strawberry chocolate scones I will post later. oooh . . . will check that out! 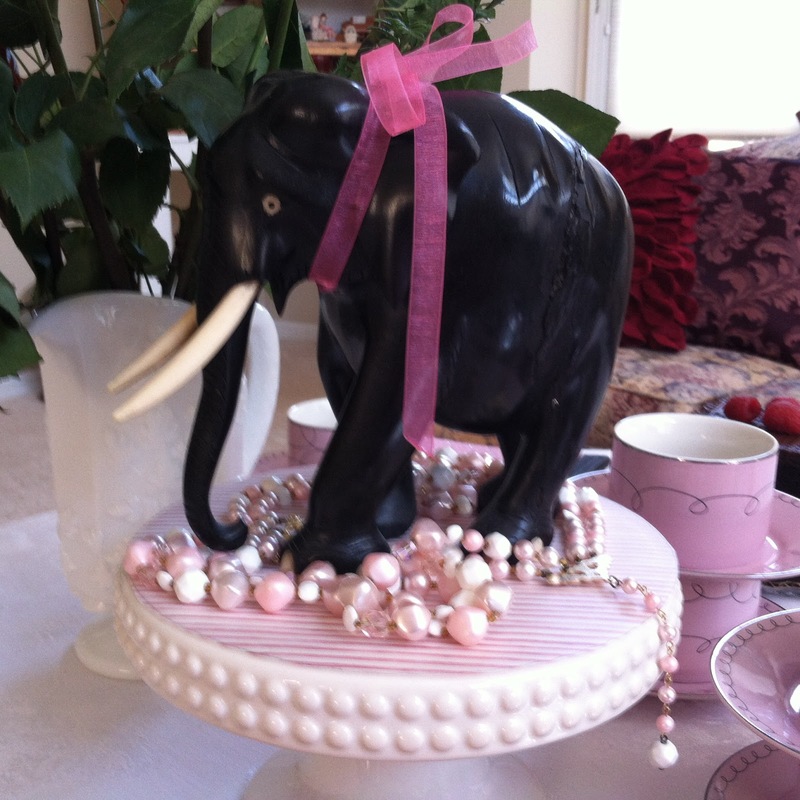 I loved how you decorated your table using the elephant. How unexpected and wonderful! Your daughter has great taste and her teacups match your new teapot perfectly. I'm sure you'll enjoy your new teapot each day. The pink is such a happy colour....good choice! might have to give her another makeover so you won't recognize her. maybe some jewels? Love your page Deborah. I love the work of Valentine Design. She is amazing. Your pink tea is stunning. So chic and glam. It reminds me of Paris a bit. My daughter would like that. She's dying to go! DARLING is the one word that says it all! This looks like great fun for all! So glad you shared at Friends Sharing Tea! Thanks Bernideen. Friends are wonderful, "in-person" friends and online friends. I think so too. they want to have fun too! Thanks Martha. I told Mrs. Elephant she could keep the pink bow after her photo shoot! This is all absolutely charming---I'm in a PINK phase of life right now, and I think it will last me all my days. Your hand with décor and your eye for whimsy and delight are simply wonderful. I've just joined as your newest follower and look forward to many more of your beautiful occasions to come. I love your pink tea. Sweet table! Love the photos, apron, tiny cake, and edited 'watercolor'. I am like you and usually prefer unflavored black tea. Occasionally I will drink an Earl Grey if it is very high quality but don't go for various artificial flavored teas. Thanks for stopping by my blog, Deborah. How lovely to have you visit and join us at Lawn Tea!! Wish we could share a pink cup of your tea and a slice of my pound cake right now. Tell your little Miss Pachyderm have I got a FRIEND for HER! One of the liquor stores has a fancy pink Miss outside the size of an SUV, with enormous Buddy Holly glasses and a martini glass big as an umbrella.